Champagne, palm trees and a two person Jacuzzi tub, looks like the start of a great weekend to me! come on over for a drink. 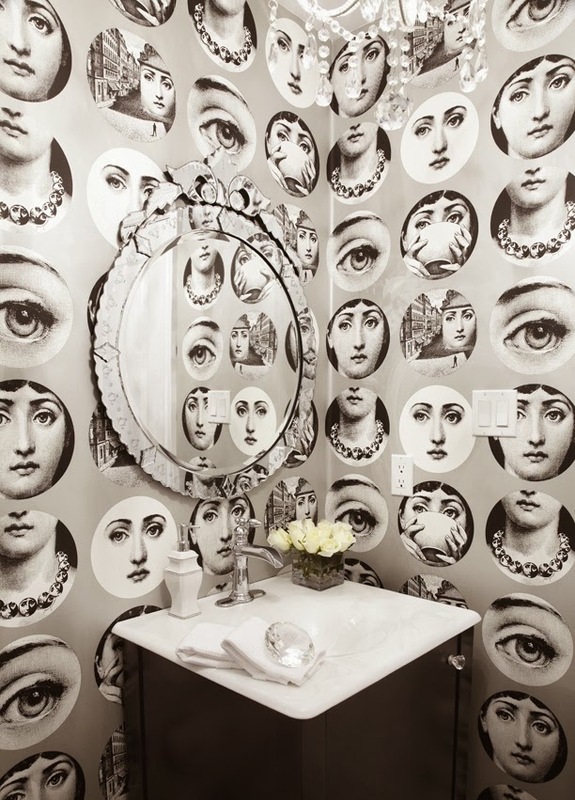 This Fornasetti wallpaper of the many face of Lina is so perfect to use in a bathroom or powder room. 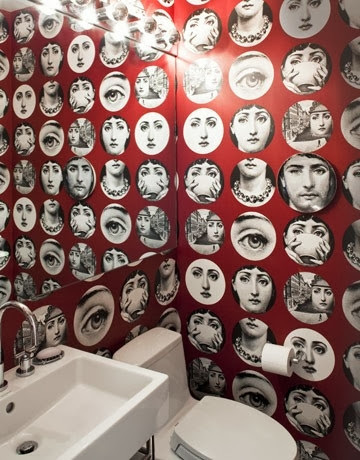 You can really enjoy looking at all the different incarnations of Lina Fornasetti created. 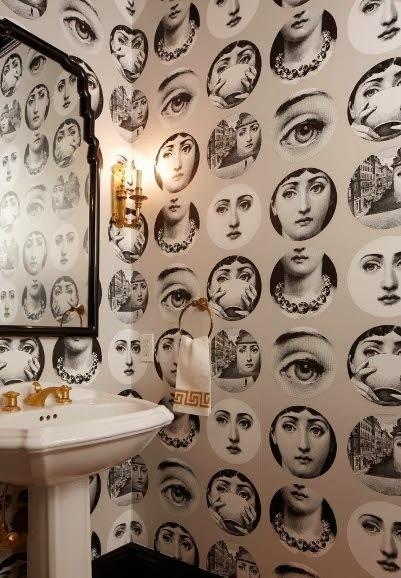 The wallpaper was supposedly discontinued for awhile, but thankfully it looks like they've brought it back. 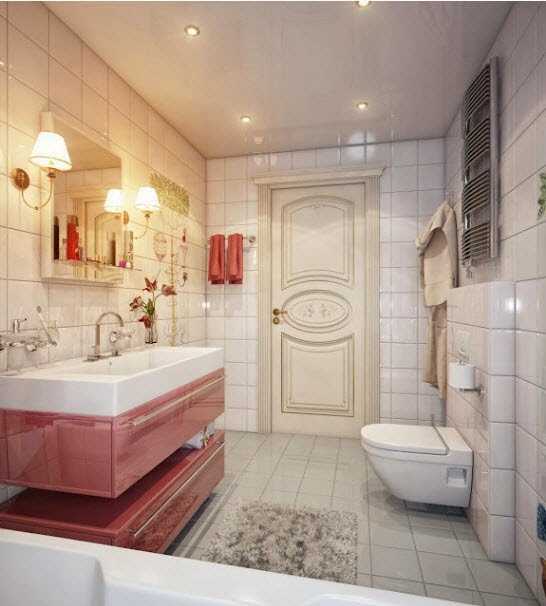 The design of the first bathroom is so well thought out. 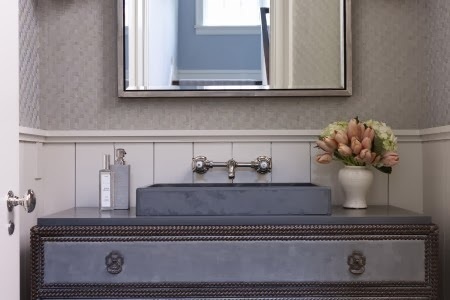 Using an open washstand instead of a solid vanity doesn't block out any of this gorgeous wallpaper. 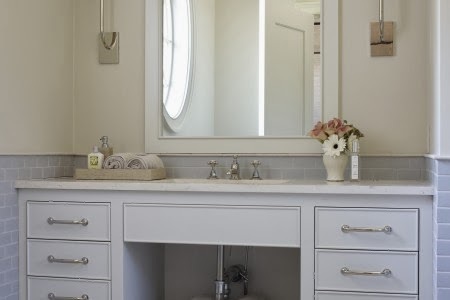 A floating vanity would also work as you'll see in the very last photo of this post. 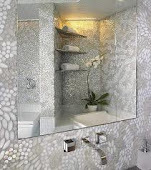 And the big white floor tiles are nice and neutral so they don't compete with the busy wallpaper or overwhelm the eye.The designer was also really smart, instead of wallpapering all the walls they put a floor to ceiling mirror on one wall reflecting back the pattern, it adds a lot of depth to the feel of the bathroom. 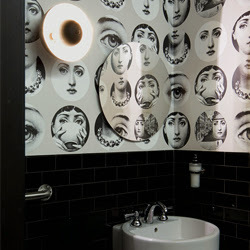 Notice that they also wallpapered the ceiling. 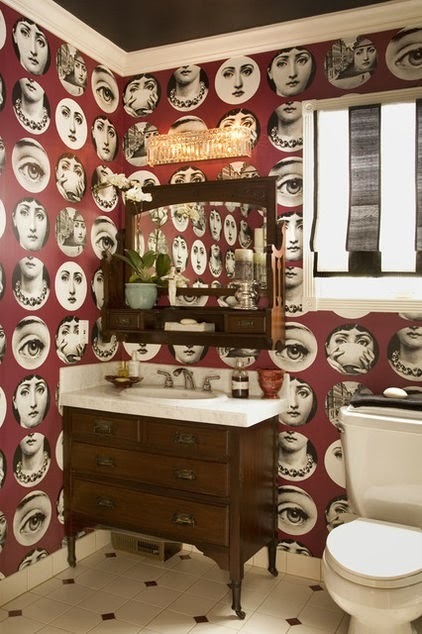 Wallpapering the ceiling adds to the fun of this bathroom. 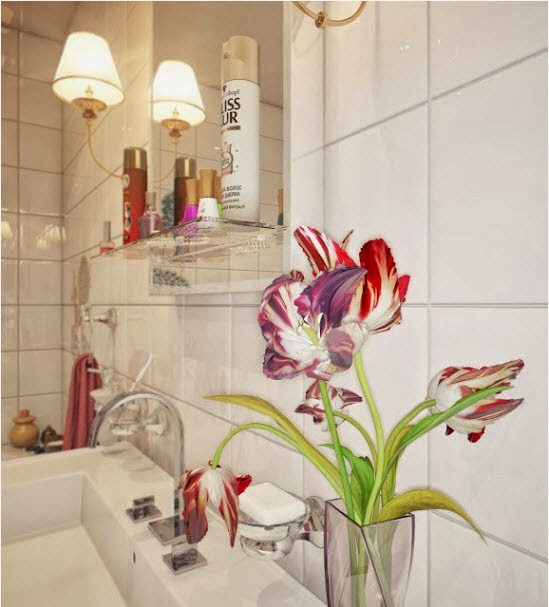 It looks like you are inside a decorative shoe box. 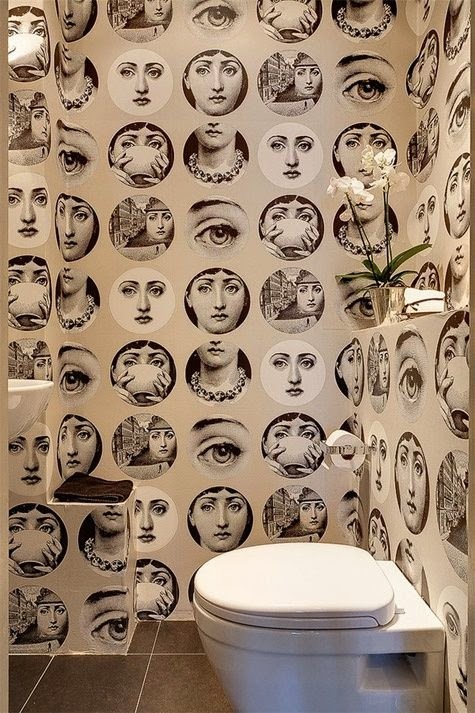 Are you loving this wallpaper? 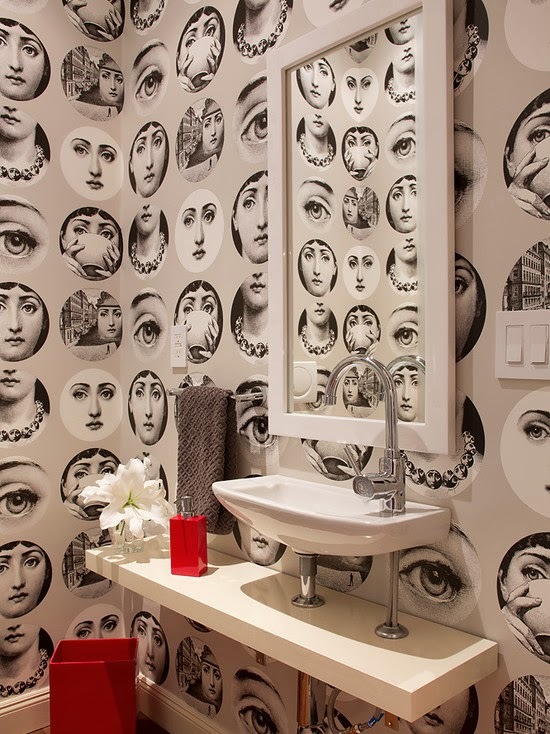 Doesn't it make you want to go wallpaper a cute little powder room? Tema e Variazioni wallpaper is available here. It comes in the 3 colors in the photos above, grey, beige and red. Wish they had a few other color choices. I think blue, green, pink, silver and gold would all be chic. A patterned background, such as stripes, floral or Malecite would be interesting too, not sure if it would be way too busy thought. 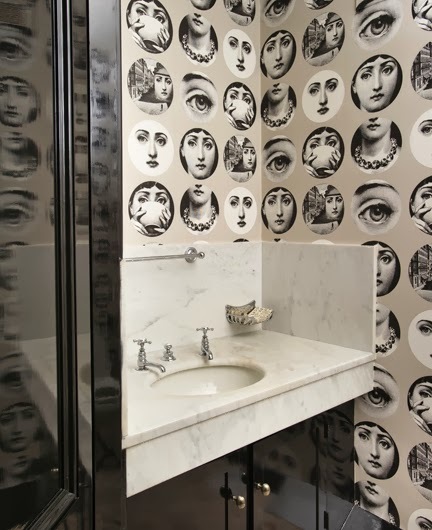 And to discover more of the enchanting world of Fornasetti go here. Now this I have never seen before. 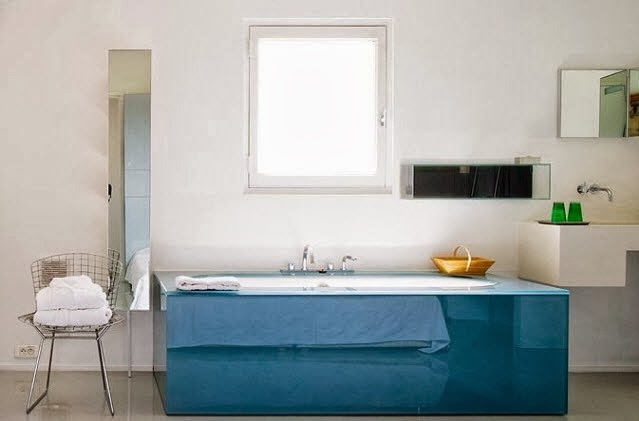 A floating bathtub, that is different! 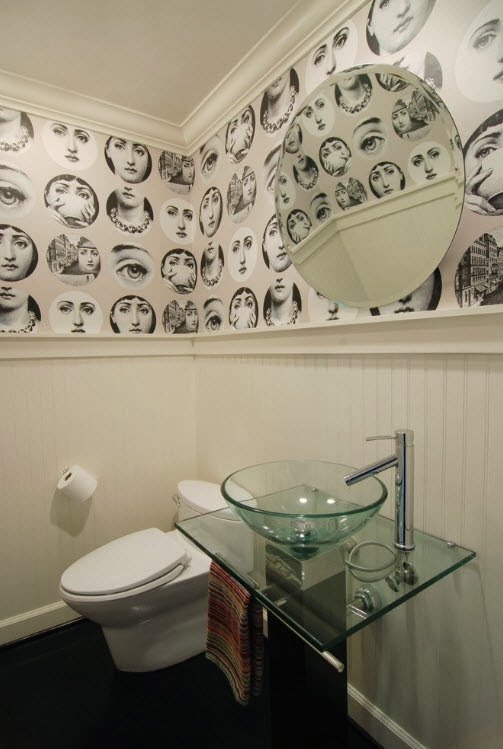 Perhaps this bathroom belongs to a magician who loves to levitate people. The longer I look at it the cooler it looks. 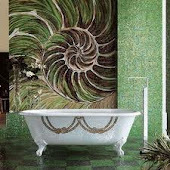 I just keep on picturing how it would look with someone sitting in it scrubbing their back. Neat. 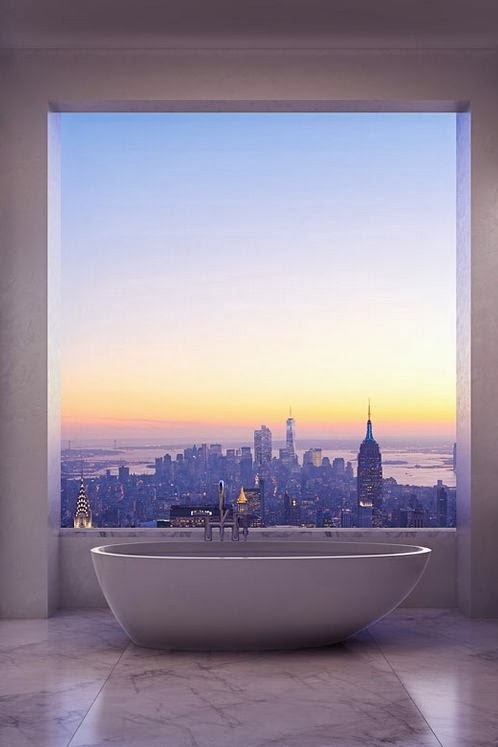 Is this not one of the most spectacular views you've seen from a tub? This is incredible. It looks like something out of a movie. 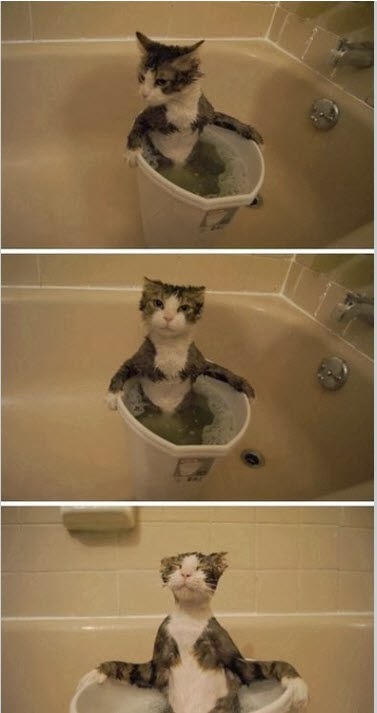 I wonder who's tub this is. They must be living such an extraordinary life. To lie there basking in that view would make me want to do some serious shopping in NYC. First stop buy up Tiffany's, next stops Neiman Marcus, Saks and Bergdorfs! Do you miss Desperate Housewives? I loved how much Bree Van de Kamp changed over the years. It must have been a lot of fun playing her. It's been awhile since we've seen Marcia in a nice juicy role. I think it's high time we see her back on a sitcom playing another feisty character. She has a Master's degree in psychology. In 2007, Marcia filmed two episodes of Desperate Housewives in her own home, after being put on bed rest until the end of her pregnancy. 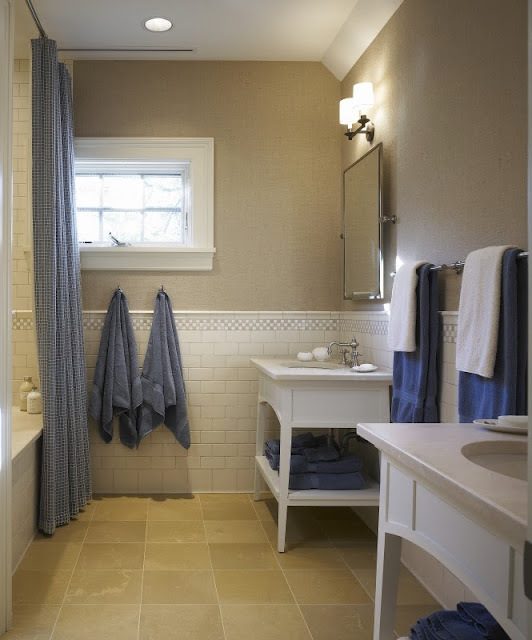 Marcia’s home was transformed into a set that looked just like her character Bree Van De Camp’s. Marcia and Desperate Housewives co-star Teri Hatcher both made guest appearances on Seinfeld as prospective girlfriends of Jerry Seinfeld. Marcia also previous starred with Nicolette Sheridan, another of her Desperate Housewives co-star, in a 7-Up Plus commercial. 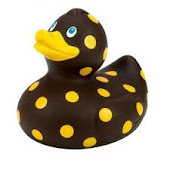 She used to swim at the same pool as Madonna. Marcia said that Madonna would get out and put all kinds of jewelry on meanwhile Marcia would go home with her hair all wet. "I think life just gets better and better as you get older." "My worst feature is my messiness! 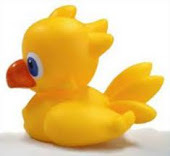 It takes me forever to keep track of myself." 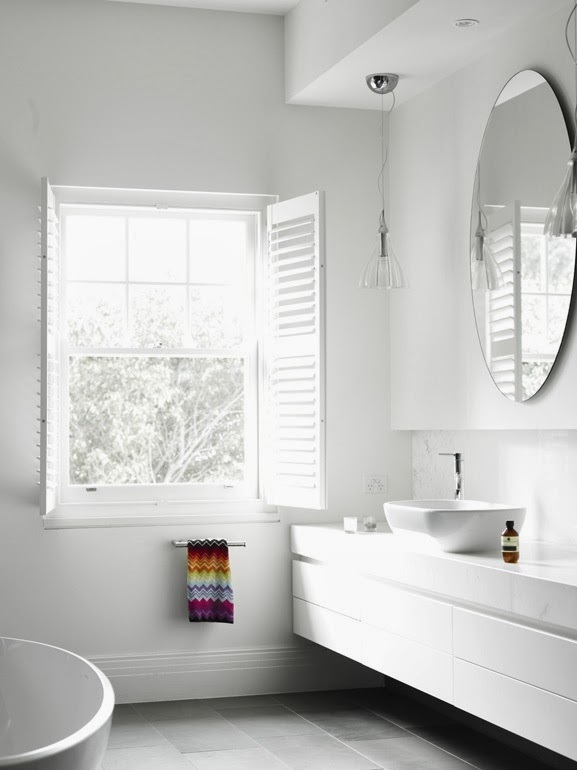 If there's one thing that can make any bathroom look instantly chic-er it's by adding a Missoni towel or a whole set of them. 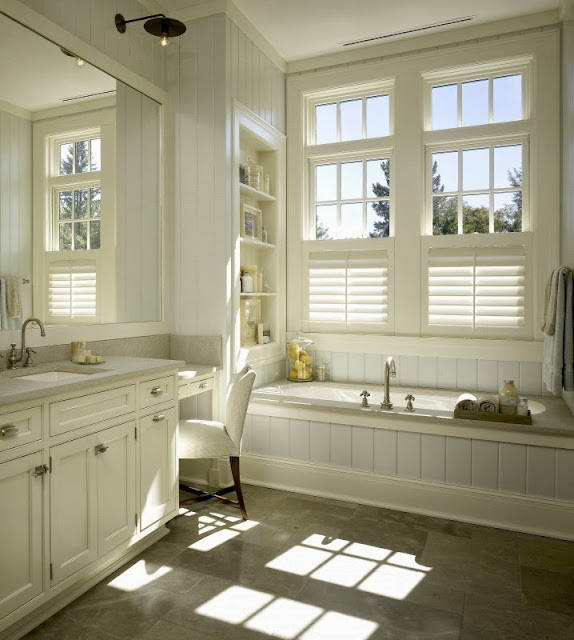 They just give the perfect pop of color and style to a bathroom. These towels always seem to steal the show! 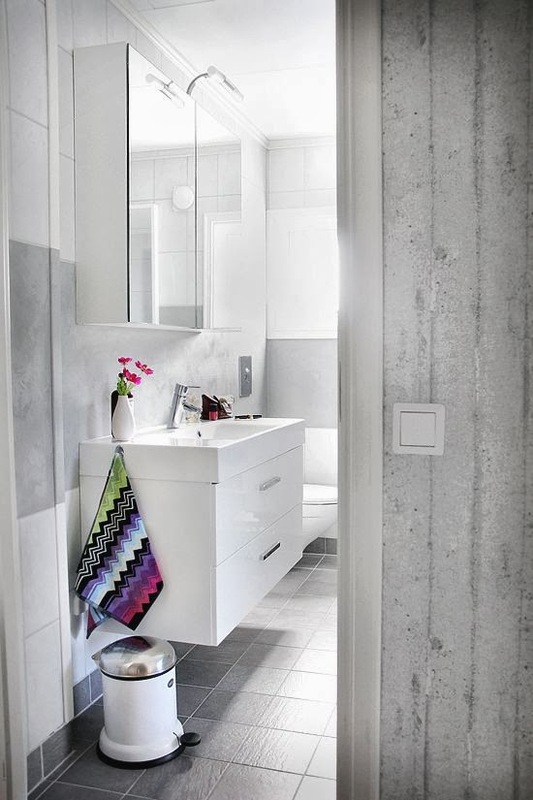 Don't you find that these Missoni towels just look so good against the Carrera marble? 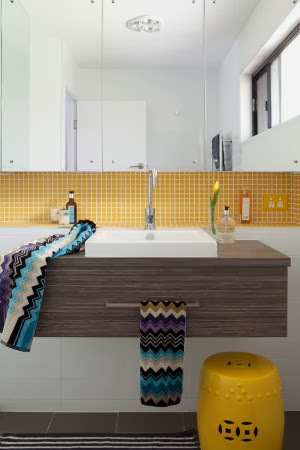 My favorite Missoni pattern is their trademark chevron pattern, isn't it everyone's? 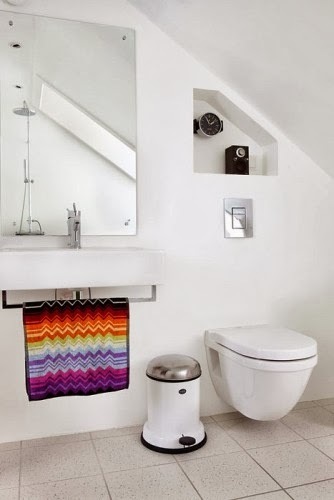 I love the purple, blue, orange and black chevron towel on the bottom left. 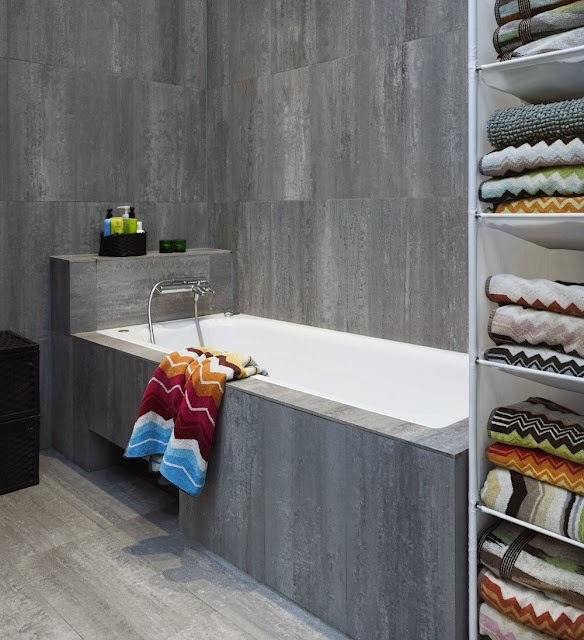 What's also great about Missoni towels is that the pattern is unisex, no complaining from the guys that the towels are too girly. 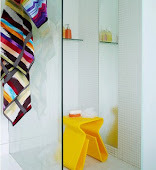 A bunch of my guy friends also have Missoni towels on their wish lists too. 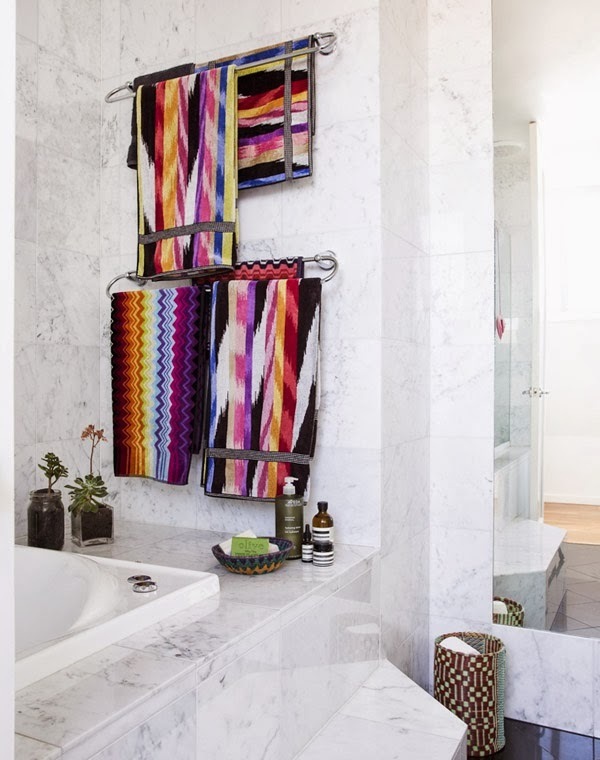 Aren't Missoni towels just gorgeous? Will you be adding them to your wish list too? 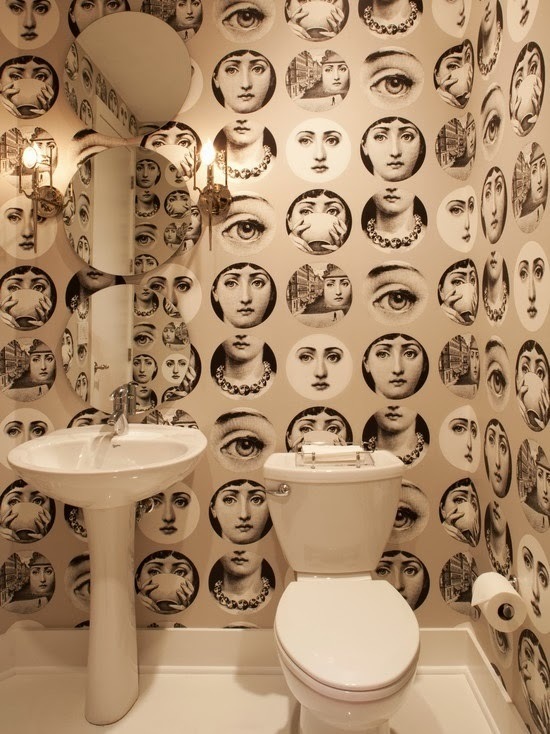 Sometimes you come across a bathroom and think, wow, that is just crazy cute. 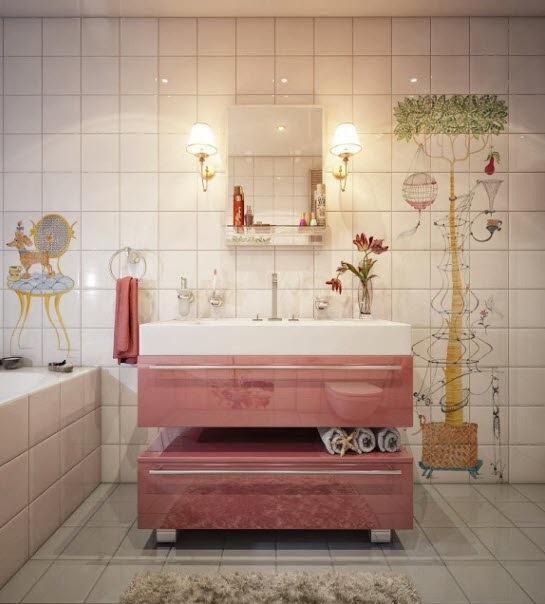 This bathroom makes me feel like I've stepped into a sweet children's book. 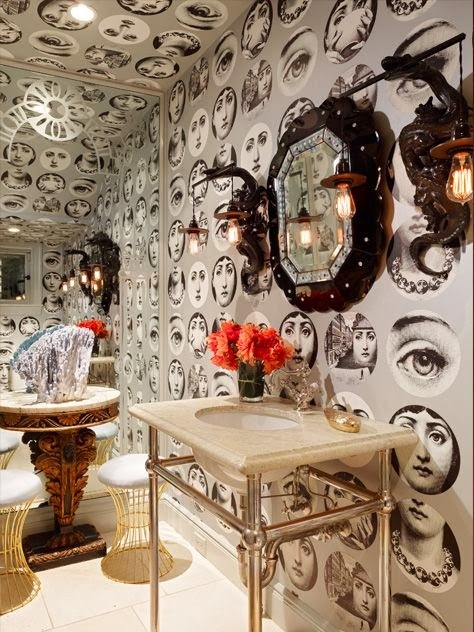 I love all these whimsical designs - especially the poodle standing on the chair. 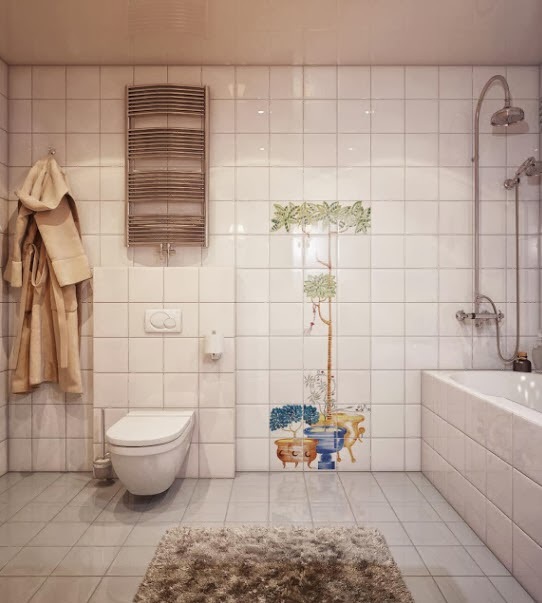 I can just picture a little girl sitting in that tub making up stories about all the characters painted on her bathroom walls, letting her imagination create a little world around her little bathroom buddies. 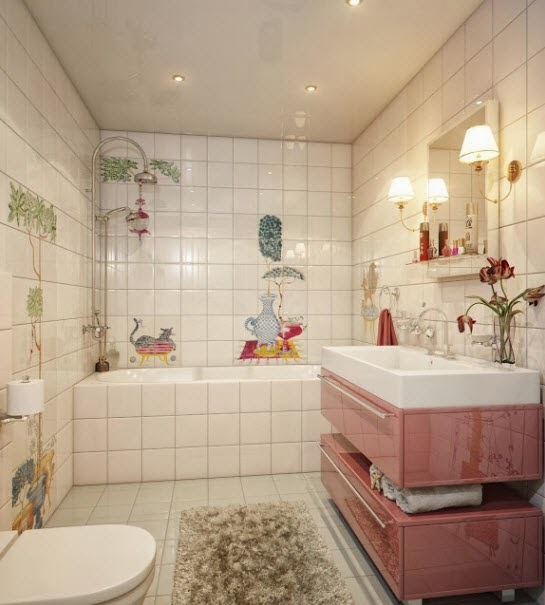 What little girl wouldn't be in heaven owning this adorable bathroom? 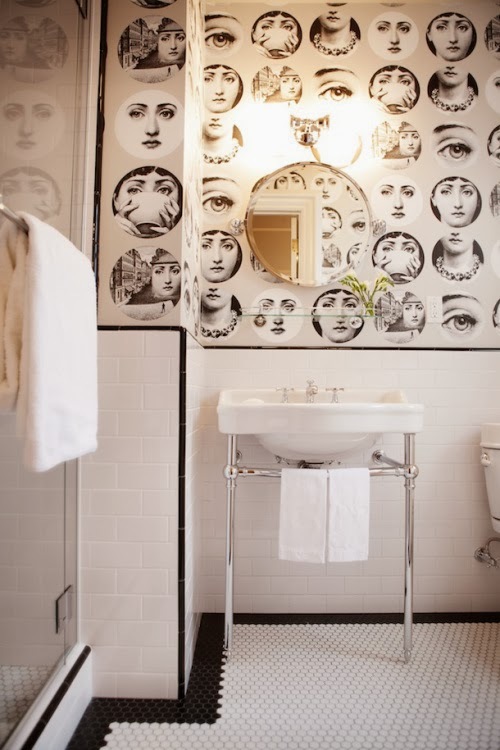 Such a happy, fun bathroom. 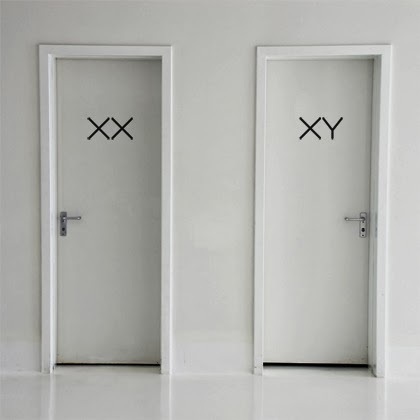 Gotta say these are the most original bathroom signs I've seen yet! 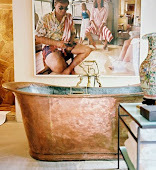 This tub design would look killer in a bachelor pad. 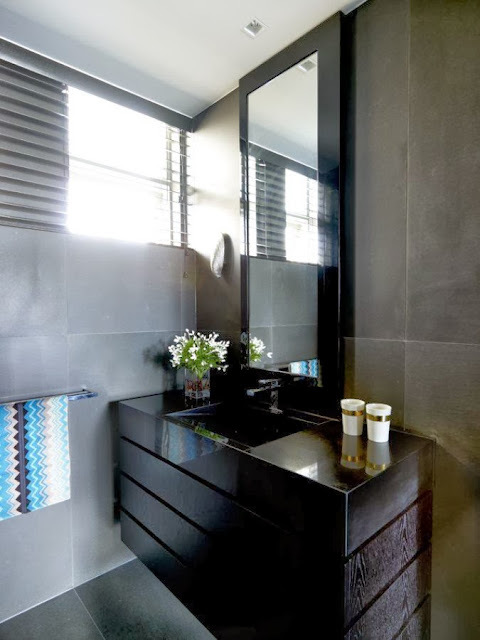 Maybe an all matte black bathroom with black towels and just this electric blue tub against a black brick wall, ok, and maybe throw in some neon lettering on the wall, I'm thinking white neon lettering. 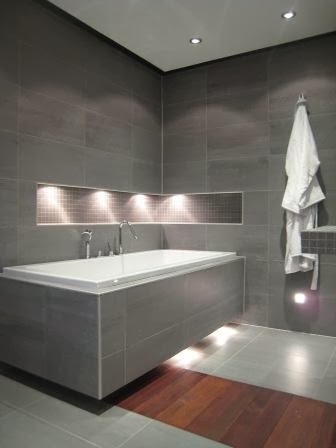 At the complete opposite end, it would also be cool for a kids' bathroom - a clean white bathroom and this great tub. Those little sweeties would have a blast checking out their Smurfy reflections in the side of the tub. 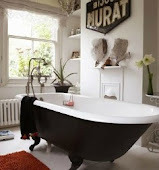 I don't think there would be any complaining about bath time with a tub like this. 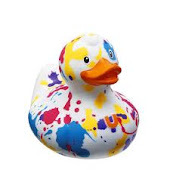 I'm picturing it looking good in metallic lime green, neon purple, shocking yellow, bright pink.....oh some many cool choices! Ever drive by a house and wonder what the inside looks like? Ever see a house you have been dying to see the inside of go up for sale and you go on the realtor site just so you can finally see what the inside looks like? I've done this plenty of times. There have been homes I bicycled by hundreds of times as a kid or passed every day on the way to work that suddenly went up for sale. It's always so interesting to see the inside. Not once did the house ever look the slightest like what I imagined in my head. 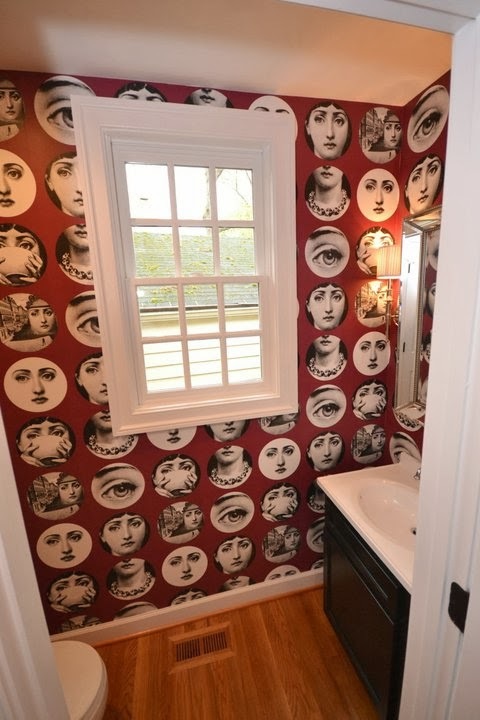 Some interiors were really surprising. Like they say you should never judge a book by it's cover, same usually goes with homes. 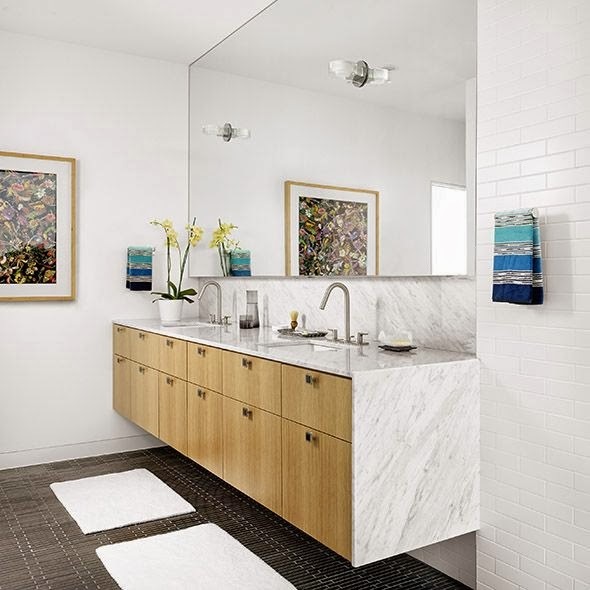 Well in the case of these 2 homes it's the opposite, the exteriors and the bathrooms are a perfect match. They are so perfectly matched I've got to wonder if the owners favorite colours are grey and more grey and if these 2 houses were bought by twins because they are extremely similar! 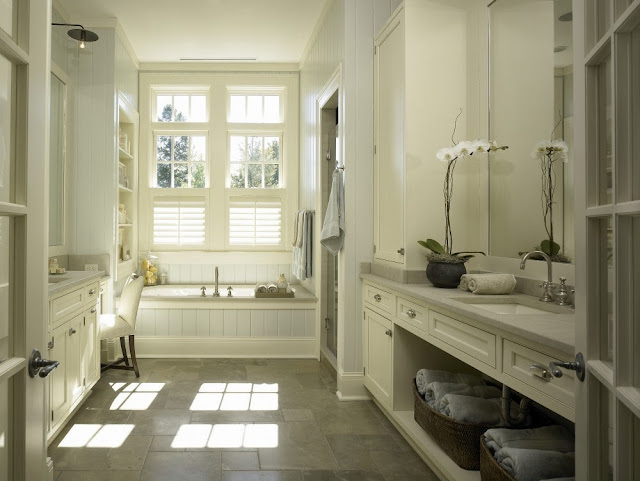 Here are the bathrooms for the grey and white shingle home featured above. pretty big bathroom to do this thought. (btw, they are both by the same architect). So which house's bathrooms do you like better? 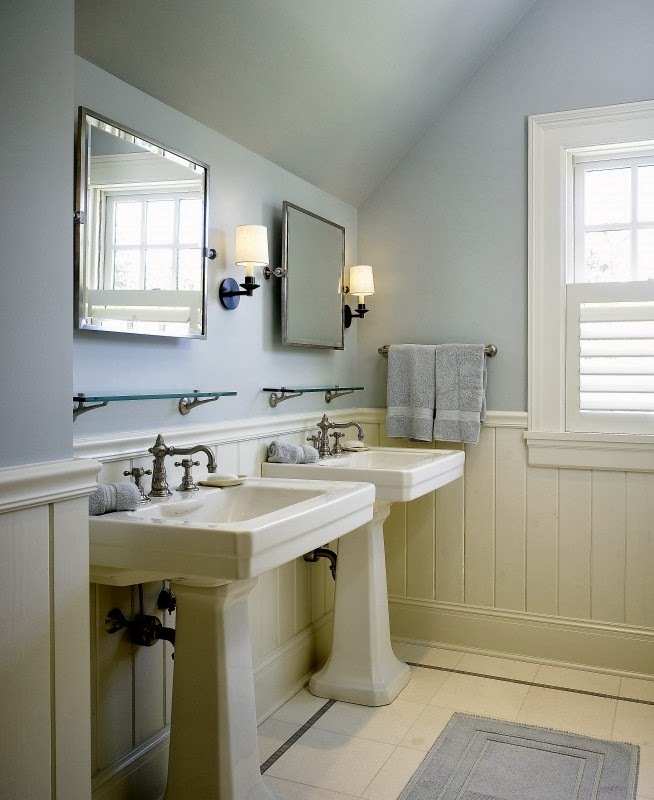 House 1's or House 2's bathrooms?